The He-111 was designed in secret as part of Hitler's plan to rebuild the Luftwaffe. As part of the propaganda process, 6 early production machines were built as airliners for Deutsche Lufthansa to showcase the latest German creations to the world. First flown in 1935, the He-111B made its reputation as a bomber flying for the Legion Condor in the Spanish Civil War, and pioneered the Lutwaffe's terror tactics as exemplified with the bombing of Guernica. As an airliner, the He-111 was a spectacular failure. Having been designed as a bomber, it was heavy, inefficient, and the BMW engines its low-priority civil status forced on it were underpowered. Lufthansa flew them between 1936 and 1940 in revenue service before they were taken over by the Luftwaffe and used as cargo aircraft. It's a flash monster! This kit is one that Toko was developing when the company was taken over by Roden. As such, it has less than the usual Roden qualities we have come to know and love. The engineering is complicated by the necessity to allow for the bomber and airliner noses, glazing and undersides. By reputation it has horrible fit that is something of a struggle to overcome. The surface detail is engraved in delicate panel lines, most of which are doomed to be destroyed by the awful fit. Needless to say, few of these will be seen on the display table, and fewer still in contests. The fuselage is split into nose, cockpit and the remainder of the fuselage. The instructions would have you join the cockpit sections to the fuselage halves, a decision that makes sense given the need to clean up the join line. The interior floor is wider than the fuselage, but that's okay, since the cockpit glazing is also too wide. You'll need to insert a thin triangle of plastic into the upper fuselage join in order to make everything fit properly. The bulkheads and seats also make for an uncomfortable fit. The wings are each comprised of an upper and lower half with the full control surfaces moulded as part of the lower wing. The fit is atrocious, and much filling and sanding will be necessary. The kit has a propensity to end up with one wing sitting higher than the other, so repeated test fitting, trimming and sanding of the wing roots will be necessary. The He-111's wing centre section was similar to that of the DC-3 in that it lacked dihedral. All dihedral is outboard of the engines. The landing gear well sidewalls are to be trimmed down according to the instructions, but there is no indication of how much trimming will be necessary. Online build articles put the amount at around 2mm. The wings are the metal bomber wings with clipped tips. Most of the -Cs were first equipped with fabric-covered wings with rounded tips. Some were later equipped with the metal wings, but it is uncertain whether the kit's subject was one of them. The tailplanes are one piece, with a separate elevator. They are fairly thick, and suffer in places from sink marks and flash. Filling and cleaning these up will destroy the delicate engraving. The rudder is a separate piece, but it is designed to be mounted in the neutral position only. The engines are quite complicated. There is an aft section that slots into the wing leading edge, left and right nacelle halves and a cap piece. The exhaust ports are separate pieces which could benefit from being drilled out deeper. Since they're oval, this will take some care. Once again the fit is atrocious, requiring the parts to be ground down before being coerced into place and shimmed into the leading edge of the wing. The landing gear struts and wheels are a bit basic, and the strut geometry is not clearly shown in the instructions. Several modellers online report having difficulty getting them into place properly. The decal sheet provides markings for He-111 C-02 D-AQYF “Liepzig” in Lufthansa service. Colours are overall bare metal with gloss black trim on the nose and engine nacelles and a large red flash on the vertical stabiliser. These are Roden's very early decals, and they're infamous for shattering and shrugging off the influence of all known setting solutions. I guess it's just as well that all that nice engraved detail is going to be filled, since there's no way on Earth these decals will ever be persuaded to conform to it. A clear coat will be mandatory, and I would recommend applying them over puddles of wet Future so they'll at least not sliver. He 111 C-06 Karlsruhe (D-ATYL). 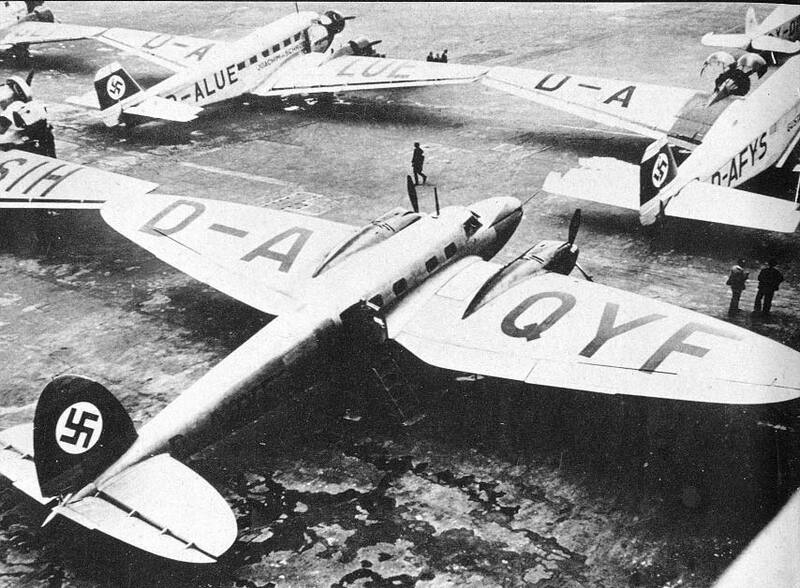 Also, the two straight-winged He-111 G aircraft D-AEQA “Halle” and D-AYKI “Magdeberg” were similarly converted. If you don't wish to convert the wing, D-AHAO “Dresden” was the V-4 prototype which was the first to be equipped with the metal bomber wing. It was damaged beyond repair in April 1936 in a taxiing accident and was never officially in Lufthansa service. D-AQYF most likely at Templehoff airport. Note the rounded wingtips. Highs: The only He-111C available. Lovely delicate surface detail. Lows: Atrocious fit, complicated engineering. Inaccurate wings. Terrible fit. Rotten decals. Did I mention the horrible fit? Verdict: If you must have a passenger He-111, this is the kit you need to conquer. Before Meteor products went out of business I picked up one of their He 111 conversions. Forget actually which one though it comes with a leading edge resin bit. Some day I will build it. Built two of Revel's kits so far. My best to you and your desire to tackle such a projekt. I built this model a while ago (http://www.kierat.de/modeling/he111/he111.htm) and can confirm the terrible fit. The tool I used most, were side cutting pliers. It's a really beautiful aircraft, though - I wish somebody would offer a technologically updated kit of it, like happened with the He 70 recently. I can only hope I get mine looking halfway as good as yours does. Which He-70 is that sitting beside it? Nice. I picked up the newish ICM kit not long ago with the idea of posing the two together.